Padmasri Dr. Sarojini Varadappan (born 21.09.1921) has a brilliant academic career. She did her post graduation in Political Science in Mysore University and post graduation in Vaishnavisim in University of Madras. She is proficient in Hindi (Visharad) English and Tamil. As a social worker, she is deeply interested in the amelioration of the living conditions of the people in the society. This spirit was inculcated in her from early childhood by her illustrious father late lamented Sri. M. Bhakthavatsalam, former Chief Minister of Tamil Nadu. While Vaishnavisim met the mundane needs of this eminent social worker, music has been her spiritual fibre. She first started public work as a volunteer during Gandhiji’s visit to Madras at the prime age of 18 years. She was for several years Chairman of Central and State Social Welfare Board and was also Sheriff of Chennai. She is the recipient of several awards in social work and scout movement and also Gold medalist of the Indian Red Cross Society awarded by the President of India. She was deeply involved in Gujarat Earth Quake relief work during the year 2001 and collected Rs. 87 lakhs as donation from the public through Red Cross. She was also instrumental to build 5 primary schools for the Earth Quake affected children in Rajkot, Gujarat. In the academic field she served as senate member of the Madras University and Executive Council member of the Mother Therasa Women’s University and also Annamalai University. Now she is a member of the Syndicate, Bharathidasan University, Trichy. 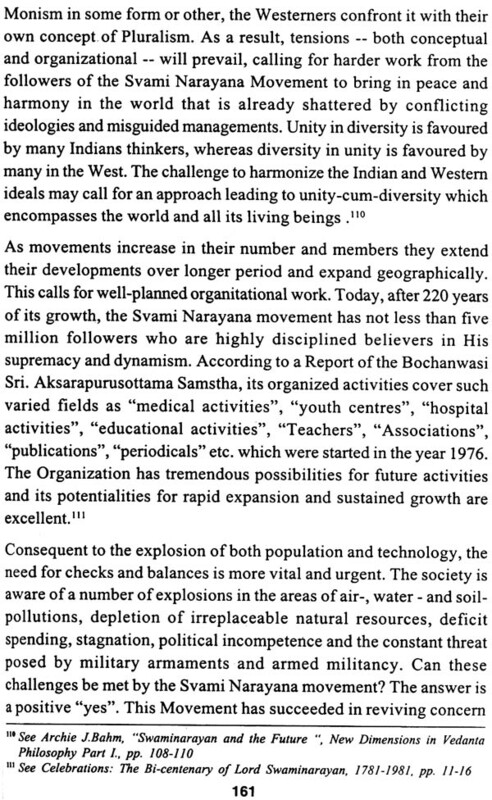 It gives me great pleasure in writing this Foreword to the Book The Concept of Social Service in the Philosophy of Svami Narayana being brought out by Dr.(Smt.) Sarojini Varadappan. This formed the Dissertation prepared under my guidance for which she was awarded the Degree of Doctor of Philosophy in Vaishnavism by the University of Madras, recently. 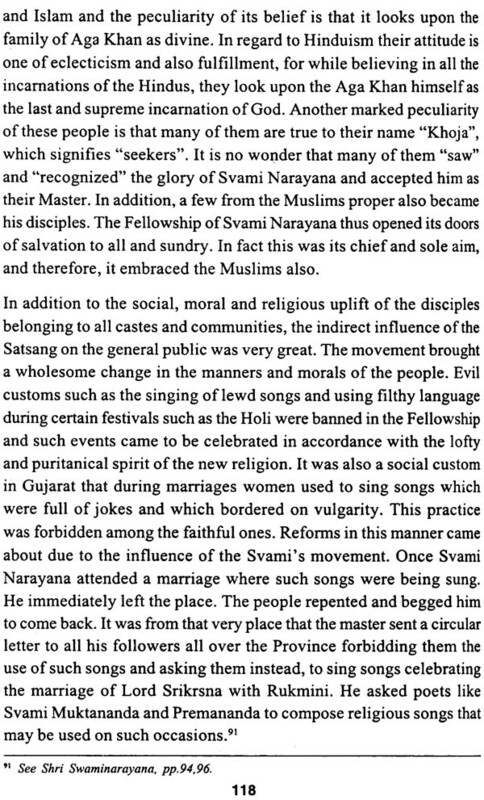 Svami Narayana (1781-1830 A.D.) who trod this earth about 200 hundred years ago was a ‘revolutionary’ Samnyasin. He took up social work as a spiritual sadhana and changed the entire concept of Sanatana Dharma. The Gita (IIIA) says: “It is not by merely giving up work that one attains perfection”. 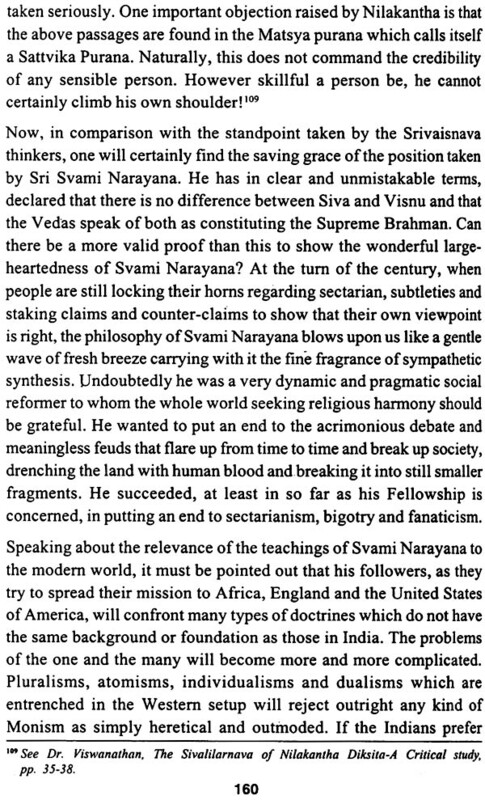 The door of Religion which Ramanuja opened to one and all without any distinction of caste, creed and colour, was kept more widely opened, if one may say so, by Svami Narayana through his down-to-earth, absolute pragmatism. He changed the convicts and culprits into useful members of society. He changed atheists into astute believers in God. He made asceticism respectable and meaningful by weeding out the element of sensuality in thought, word and deed in the minds of those who adopt it. He demonstrated by his superhuman powers that God-realization can be easily accomplished if the spiritual preceptor is really God-minded. 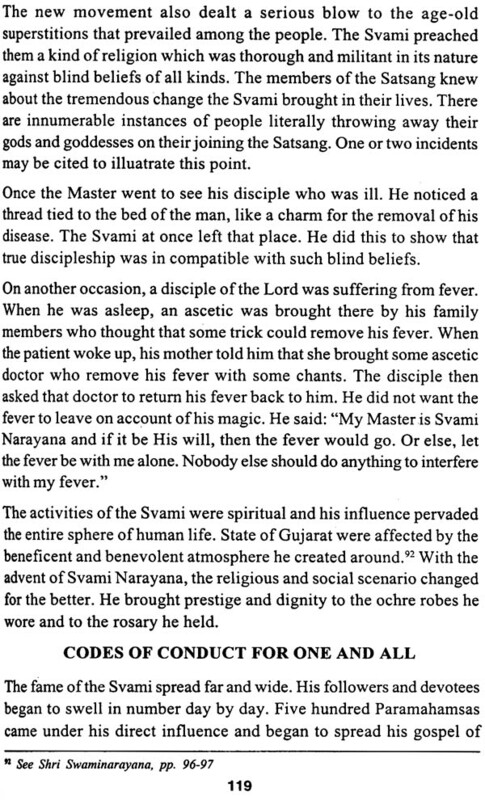 The philosophy of Svami Narayana is known as Navya Visistadvaita. The novelty (navyatva) he introduced is something ingenuous and inspiring. The concept of Aksara Brahman which was a ‘forgotten Empire’ was discovered, renovated and resurrected by him. He was admired not only by the natives but also by the British rulers. What guns and swords could not accomplish was accomplished by his rosary. Though he was born in Gujarat, he travelled all over the country and through his love and compassion, selfless service and spiritual sweep carved out for himself a permanent niche in the hearts of all. As all great men of vision, he also suffered in the initial stages, trials and tribulations. Although he did not believe in performing miracles, still they happened in the lives of those who loved and lived with him, admired and adored him. ‘The Sun cannot, in spite of himself, conceal his rays for long. Svami Narayana was the Sun in the firmament of spirituality. His golden touch dispelled darkness, awakened the slumbering souls, opened their eyes to their own reservoirs of spiritual strength, made them worthy of human life and made their lives sagas of peace, love and compassion. That a single soul could accomplish this spiritual regeneration vouchsafes the belief that he was Purusottama Himself. Knowing about him and his work is certainly a ‘rebirth’; practicing what he preached about two hundreds ago is the reawakening of the inner spirit. By the same token, writing a doctoral dissertation about him and social service which was streamlined by spirituality is indeed, a rare distinction and blessing one can think of. I am happy that Dr (Smt) Sarojini Varadappan became the chosen instrument of the Svami in revealing an interesting aspect of His life - the aspect of social service! imbedded in his philosophy. Every school of thought has its own sampradaya (tradition). One should study the tradition well before attempting to analyze and comment on a particular philosophical school. I am delighted to state that Dr. Sarojini had a first-hand knowledge of the Svami Narayana tradition from the highest source itself. She went to the Svami Narayana centres in Allahabad and London, and saw for herself, the way the system is lived there. This has put her in a very covetable position to take up the present topic and work upon it for the Doctorate Degree. She has already made a name for herself as a self-less social worker. In the Preface to this work, she has traced this spirit in her life to the spiritual ‘Vaishnava’ atmosphere in which she was born and brought up by her parents, especially by her beloved father, the late-lamented Hon’ble Sri M. Bhaktavatsaiam, former Chief Minister of Tamil Nadu. All their blessings bore fruit in the fullness of time. The result is the present work, which I am sure, is the best tribute she can pay not only to her parents but also to the noble spirit of social service which moved, moulded and motivated many of our spiritual heads, thinkers, statesmen, freedom fighters and social reformers. The Present Thesis incorporates the research work done by me as a full-time scholar in the Department of Vaishnavism, University of Madras, during the years 1996-1999. As a Social Worker, I am deeply interested in the amelioration of the living conditions of the people in society. This spirit was inculcated in me from early childhood by my illustrious father, late lamented Sri M. Bhaktavatsalam, former Chief Minister of Tamilnadu. I had the opportunity of undergoing the Certificate and Diploma Courses in Vaishnavism in the Department of Vaishnavism, University of Madras. This came as a boon to me who was born as a Vaishnava. This opened up the gates of a new world as it were. I had the opportunity of studying the lives of the Alavars and the Acaryas who inspired pople with their mystic, songs and writings. I also had the opportunity of studying in detail about the life and work of Sri Ramanuja whose Philosopy is called Visistadvaita and whose large-heartedness was glorified by Swami Vivekananda in his lectures and writings. I knew that it was Sri Ramanuja who, after the Buddha, had a deep concern for the uplift of the downtrodden, lower classes of society. His efforts to admit the lowest strata into the temple of Lord Tirunarayana at Melkote in Kamataka, about 1000 years ago, speaks volumes about the great social reformative zeal of Sri Ramanuja. After finishing the Diploma Course at the Department of Vaishnavism, I developed a deep urge to work for Ph.D. in Vaishnavism. When I approached Dr. M. Narasimhachary, Professor & Head, Department of Vaishnavism and expressed my desire to do research, he, knowing my background and interest in social work, suggested that I take up the topic “The Concept of social Service in the Philosophy of Sri Svami Narayana”. Svami Narayana was great religious leader and social reformer of Gujarat who flourished between A.D. 1781 and1830. He favoured Sri Ramanuja’s Visistadvaita as the viable means of fulfilling the spiritual aspirations of a man. His Philosophy is called “Navya Visistadaita”. He introduced a few important changes also in the system to suit his own genius and the need of the times. My Professor told, me that although some work had been done by scholars on the life and teachings of this modem Prophet of Gujarat, no serious and sustained work was done to trace the origin and development of the concept of Social Service as found in the teachings and philosophical writings of this School. I found the topic very much to my satisfaction and took up the work. To achieve the objective, the Thesis has been divided into five chapters. Chapter One explains the salient features of the Visistadvaita Philosophy of Ramanuja after a general introduction. Attempt has also been to highlight the novelty found in Svami Narayana’s Philosophy. The Second Chapter traces the origin of the concept of service from early times, going back to the Itihasas and the puranas. The Mahabharata in particular, is a storehouse of many an anecdote highlighting the importance of “service” done to those in distress - be it a man, beast, or bird. Chapter Three provides a detailed account of the basic principles of the Navya Visistadvaita Ph.ilosophy from the viewpoint of social service. Chapter Four gives a detailed account of various incidents and happenings in the life of Svami Narayana which bring out his deep concern for the welfare of all the living beings in society. How he inspired the people, taught them and helped them with profound sympathy and love for them, have been dealt with at length in this chapter. Chapter Five provides the conclusion for the Study. The special importance and relevance of this Philosophy to the modem times have been highlighted in this chapter. Now it is my pleasant duty to thank all those who inspired me and helped me in preparing this Thesis. I wish to thank at the outset the authourities of the University of Madras for according me permission to join the Department of Vaishnavism as a full-time Research scholar in January 1996. I am highly thankful to my Supervisor, Prof. M. Narasimh achary who not only suggested the topic for my research but also helped me in preparing the Thesis at every step. He taught the methodology of research and gave me the material to read. He read the entire Thesis and offered valuable suggestions for improvement at every stage. But for his kind help, I could not have completed my research in this fashion. For this, and for the personal interest he took in my work, I am always grateful to him. I also wish to thank Dr. V.K.S.N. Raghavan and Dr. M.A. Venkatakrishnan, Professors in the Department of Vaishnavism, for their cooperation and encouragement in the course of my study. I wish to place on record my sense of deep indebtedness to my husband, late-lamented Sri C.N. Varadappan who was a constant source of encouragement to me in all my activities, be they social or Academic. I am deeply sensible to the fact that he is not alive to see this work of mine; but I am sure he is blessing my endeavour from his heavenly abode. I also wish to thank and bless all my family members, especially my niece, Smt. Jayanti Natarajan, Who in spite of her busy schedule, used to encourage me in my research activities. The System of Vedanta that was established on a sound foundation by Sri Ramanuja (A.D.1 0 17 -1137) is now popularly known as Visistadvaita. He was not its founder. He is regarded as the first theologian whose doctimes were accepted by almost all the Vaisnava thinkers who came after him chornologically such as Nimbarka, Madhva, Vallabha, Srikrsna Caitanya and last but not the least, Svami Narayana. For instance, the importance of Bhakti and Prapatti as the alternative means of liberatioin, the reality of the universe at all levels of experience, the concept of liberation as marked by service done to the Lord in His highest abode, etc., are the points that are common among various theological systems. But for a few minor differences in the technical terminology, one may say that there is virtually no difference between Ramanuja and other Vaisnava Philosophers. It is therefore necessary that we understand the basic concepts of Visistadvaita Philosophy first which has been the source of inspiration for Svami Narayana, whose concept of social service in terms of philosophy is the theme of the present Thesis. Ramanuja’s Visistadvaita offers a superior alternative to both radical dualism / pluralism and radical monism, the two extremes with which Vedantic schools have aligned themselves. It is of course true that Reality does not admit of differentiation as well as unity at the same time. But the apparent paradox in Vedanta can be easily solved if we maintain that relative truth is not defective in priniciple, although the whole cannot be represented by the part. The apparent differences between mind and matter or soul and non-soul, between one soul and another, or between one thing and another, or between God and man have seemed to many to be of an absolute character. It was also believed that if the gap could be bridged, important differences would be obliterated into a bland uniformity. 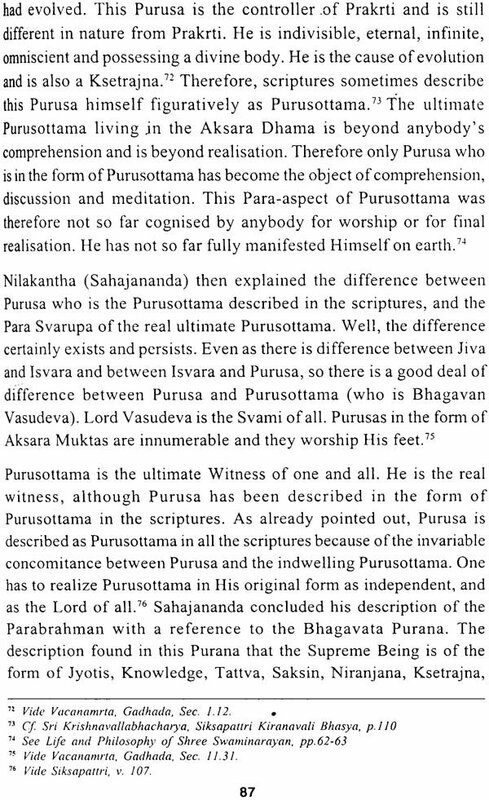 The Sankhya concept of unqualified dualism between Prakrti and Purusa, and its pluralism with regard to the Purusas (souls) was to some extent, an attempt to provide an alternative to a Monism which would absorb all souls into one universal Soul or Brahman.’ Dualists maintain that no interaction would imply something in common and therefore, some degree of similarity between the entities. They point out that key differences are real but only at the very high risk of making difference absolute. In their anxiety to treat as radically different that which they wanted to keep distinct and separate, they failed to allow for the coherence necessary for any plausible account of the world- phenomenon, Samkhya, for instance, argues that the Purusa cannot possibly arise from or take part in the affiars of Prakrti, being so radically different from it; but then finds itself unable to give any reasonable account of how it is that the Purusa can be deceived by Prakrti or mistake itself with the phenomenal self in Prakrti. The point to be realised is that there is some sort of unity in reality, perhaps more unity than pluralism can adquately be accounted for by philosophers. If the pluralist philosophies have not succeeded in doing justice to unity, then, monistic schools have also failed to do justice to difference. The unqualified monism of Sankara has failed in rendering justice to diversity. Sankara’s claim that the universe is undifferentiatedly one, arguing that the concept of difference, is indeed, inconsistent. If there could be interaction between two things, or even if they are conceived of as being together, then there must be something in their nature which admits of this kind of interconnection or interaction. Total interconnection is taken by Sankara as the meaning of absolute identity. The universe, to be fully conceivable, should be fully inter-related and therefore, undifferentiatedly one. This is really an argument for oneness. But Sankara has over- concluded to the undifferentiated oneness his theory of demands, as if our choice were between absolute separation and absolute identity. Strictly speaking, the appearance of diversity in reality can only be adequately explained on the basis of the principle that there is diversity in reality. Sankara, however, maintains that the one undifferentiated universe appears differentiated when reflected in our ignorance. Yet if the appearance of diversity arises from our ignorance, then the differentiating principle must lie in reality, if our ignorance is real. If our ignorance is not real, then diversity is not real either, being only a type of ignorance due to our ignorance. According to the Advaitins, the uniform one is obscured by a kind of ignorance arising from ignorance in a perpetual cycle. So as to give an account of reality, therefore, we should have a place for diversity also. Ramanuja’s asrayanupapatti argument against Advaita is on these lines. He argues that avidya (ignorance) cannot be adequately accounted for by the Advaitins. Ignorance cannot really be in Brahman, for then it would be incompatible with unqualified Brahman. Ignorance cannot even be in the jiva, for the soul itself is a figment of ignorance. Nor is there any other place where ignorance can exist. So Ramanuja concludes that Sankara’s account of ignorance is defective and that there is more diversity to the universe than Advaita could comprehend and account for. Instead of rejecting diversity in favour of unity and instead of committing the opposite fault, Ramanuja finds unity in diversity, the one in the many, as the only plausible solution.